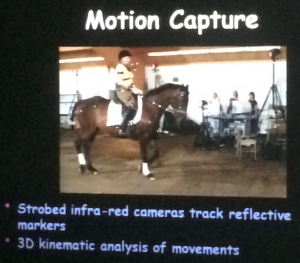 Saddle Research Trust Conference – Part 1. Rider Evaluation and Improvement Tools. Rider Evaluation and Improvement Tools. Like many riders, I almost invariably ride alone, and I really feel the lack of a great pair of eyes on the ground to correct me… but, much as I’d love to have my trainer with me every second I ride, even the best trainer in the world can’t correct you instantly if you collapse at the waist, drop a hip, twist, etc (especially if you’re at the other end of the arena at the time!) So, any ‘tools’ that could give instant biofeedback – alerting me to a fault, and helping me to correct myself as fast as possible – really appeal. Professor Hilary Clayton had flown in from the U.S. to present this topic and gave a fascinating insight into what is available right now to buy (or hire), and what has been discovered by researchers in this field. Typical – round backed, collapsed in Left hip, with trunk and pelvis twisted to the Right. The effect of applying proprioceptive tape (as shown in this photo) was an increase of lumbar motion. In another study, 5 out of 6 advanced dressage or jumping riders initially had a larger contact area (with the saddle) on the right hand side. After physical therapy to treat pelvic muscles, contact areas became more symmetrical. New: Sport Video Apps, which are simple, inexpensive tools for rider analysis. Record – import from camera roll or record in the app. Playback – slow motion, frame-by-frame advance and a scrolling wheel for precise video scrubbing. Analyse – draw, add text, allow side-by-side comparisons. Save, store, share and organise. Typically set the camera at 1/2 the height of what you are measuring. 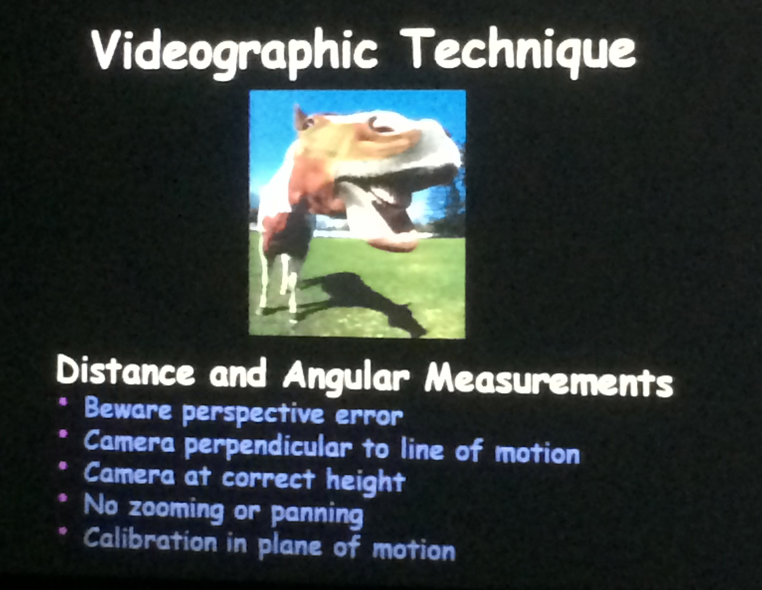 So: at elbow height to analyse the horse. Higher if analysing horse and rider. Research has shown that the horse’s movements are really driving the movements of the rider, i.e. there is a lag between the two. The closest timings between rider and horse are in the canter. Horses proved to be very repeatable in terms of stride for stride evenness etc in the studies. Inertial Measurement Units (IMU) use a computer, motion sensors (accelerometers) and rotation sensors (gyroscopes) to measure position, orientation, and velocity of a moving object without needing external references. 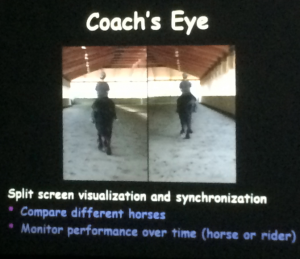 In equestrian sports one of the applications of IMUs is to evaluate synchrony between horse and rider, or between different parts of the rider’s body. The purpose-made belt (available to purchase from the website) holds an iPhone, and uses the smartphone’s inertial sensor (its inbuilt accelerometer and gyroscope) to measure precise yaw, pitch and roll along X, Y and Z axes. 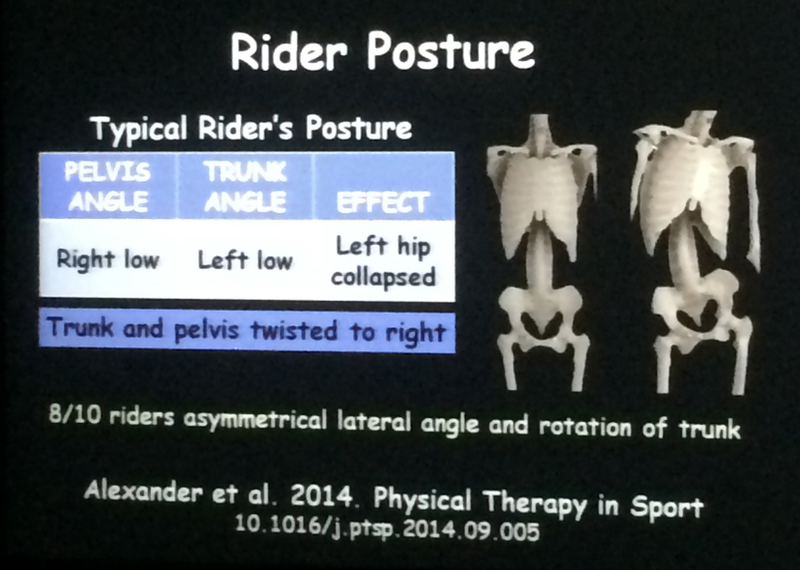 This gives instant feedback about the movements of the pelvis or trunk of the rider. Angular and side to side changes measured. The sensor is set to alert the rider (audible tone, headphone, speaker) when the angle exceeds a preset value of 2-12 degrees from neutral position. Tones can be audible, played through headphones, or can be played through a speaker so that the trainer can hear them. 2 degrees is a very small difference. Hilary advises setting it at 6 degrees, or 10 degrees for a less experienced rider. This App has already been validated in another sport (baseball pitching). It is crucial to have the Neutral setting absolutely spot on. It must be measured on horseback, with the horse perfectly square and standing on level ground, and the rider perfectly straight and in the neutral-pelvis position. The horse must be warmed up already, and the girth tightened. THEN set ‘neutral’. 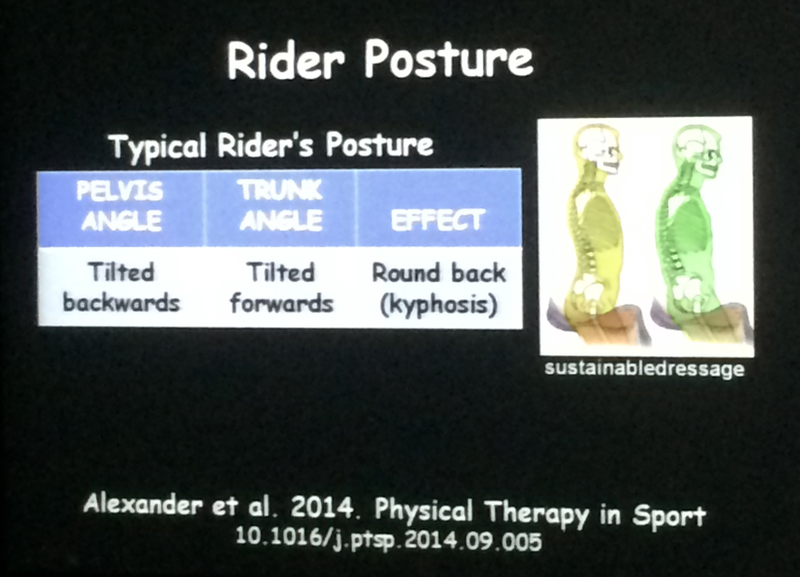 It helps the rider to be aware of poor habits that affect posture and neuromuscular coordination. 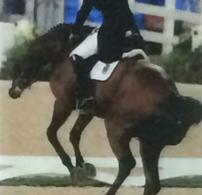 Asymmetries can originate from rider crookedness, saddle slip, asymmetry of the horse or unlevel terrain. 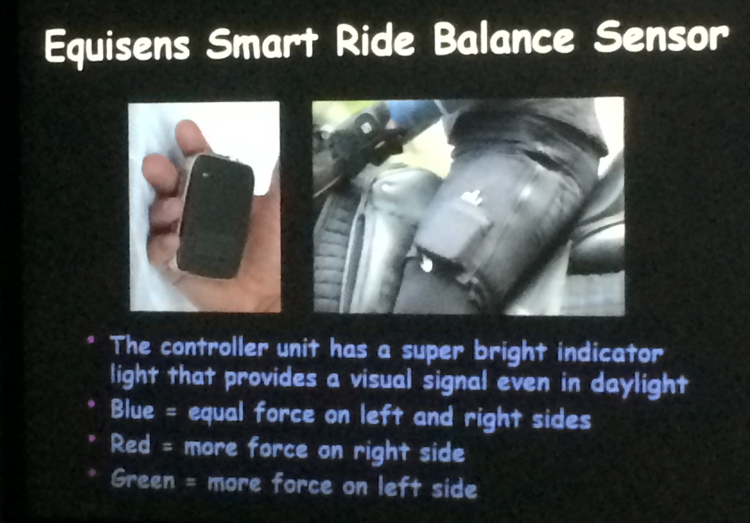 Equisens Smart Ride Balance Sensor. The sensor pad and controller are housed in breeches that come in a range of sizes. They are worn over the rider’s outer wear. the unit is self-contained and gives the information in real time so you can make adjustments as you train. 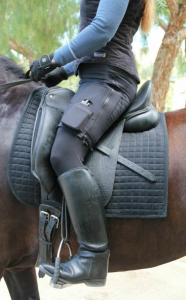 The location of the rider’s centre of force with respect to the saddle is conveyed to the rider through two vibrating buzzers located inside the waistband. When the rider’s weight is asymmetrical, the buzzer on the side with the higher force vibrates. This is very useful for highlighting exactly what a rider is doing with their body. For instance when a rider collapses their left hip, even a very experienced observer usually cannot tell accurately whether this means they are weighting the left seatbone more, or less. The rider needs to warm up, level the saddle, and tighten the girth before using the sensor. It won’t give valid data if the horse is lame or the saddle has slipped or the sensor pad is not centred under the rider. 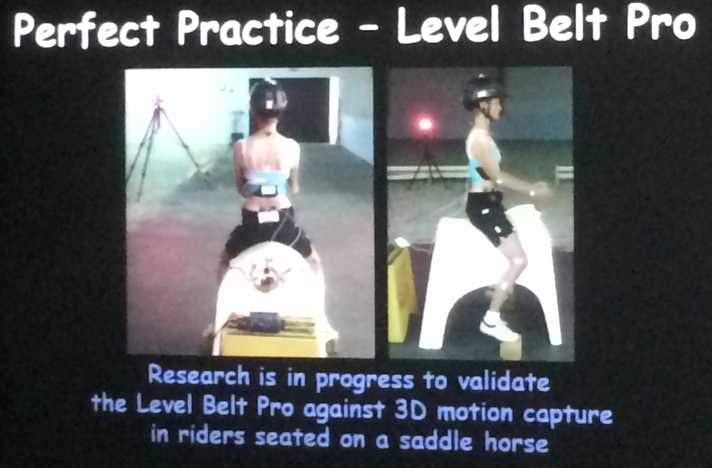 Studies are in progress comparing the data from the Smart Ride Balance Sensor with the Pliance saddle mat data. 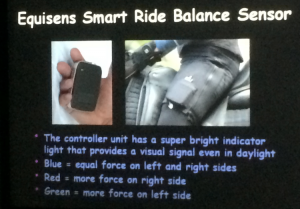 The Level Belt Pro and the Smart Ride Balance Sensor can be used together to focus rider awareness. I have just ordered the Level Belt Pro, that’s 1 of my Christmas presents sorted! The App itself is £20.99 and the Belt which holds the iPhone is $65 + $35 shipping. I think that a total of approximately £85 for a real-time corrector that I can use every time I ride is a really good deal… I’ll let everyone know how I get on with it. There’s a report of one being used for Dressage HERE, which might whet some appetites! 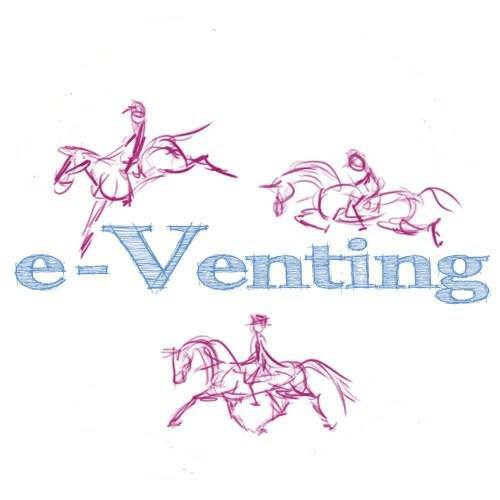 I have contacted Equisens to see whether they have a demo unit in the UK that I might be able to try, and they have been really helpful, so that’s very exciting. I promise to do a full report and videos as soon as I have given it a few goes. A genuinely huge THANK YOU to the SRT and to the day’s sponsors: Amerigo saddles, Zebra Products, World Horse Welfare, Horse and Hound, and The British Equestrian Federation. One big point that was emphasised on the day was that they want the information we all gleaned to be spread as far and wide as possible in the horse world, so it can do the maximum amount of good. So, if you see anything in these reports that interests you, or gives you a lightbulb moment, please Share it, discuss it, spread the word. Thank you! 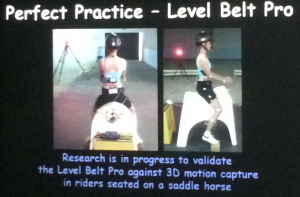 Saddle Research Trust Conference – Part 2. 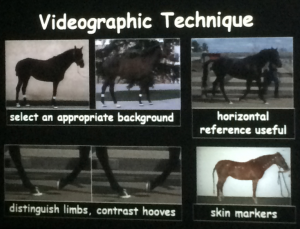 Anne Bondi: Horses, Saddles and Riders, Applying the Science. The Perfect Personalised (Christmas?) Present for an Eventer? 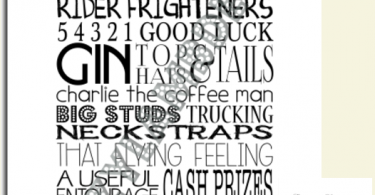 as a loner rider i’m really fascinated, and looking forward to hearing how you get on with your new Christmas present! 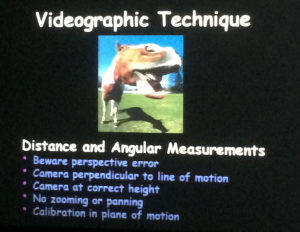 is there a danger that the tool becomes your feedback focus though and not the horse? that would be my only worry as I probably only have room in my head for one feedback opinion not two! Yes, that’s a good point, and one I’ll bear in mind! I find that I tend to ride better when I’m not concentrating hard on how the horse is going though, so concentrating on the device’s feedback might really help… we’ll see. I’ll keep everyone posted. I heard back from Equisens again this morning and they are sorting me getting that unit to try too… can’t wait, should be very interesting. Hi, I love the sound of the Level Belt Pro. But when it gives the audible signal does it just have one signal that you’re outside of the neutral range, or different signals so you know how you’ve moved out of neutral? Or do you only find that out afterwards (if you can’t tell by feel) by looking at the visual reading? I am not sure, I’ll find out fully when it arrives… it’s been shipped already, which is great service. I’ll keep everyone posted. Ok, I’ve had a play with the App (it’s on my phone already), and it looks as if it makes one noise for left tilt and/or forward tilt, and a different noise for right tilt and/or backwards tilt. It’s set at 8 degrees at the moment and takes quite a lot of movement to make the alarm go off, so it should be fairly obvious, once it’s on the body, which way you have tipped it… we’ll see! Thanks, would love to know how you get on with it and whether it’s practical to usevwhen you’re on your own setting it up etc.